I’m a representative from Tropical Fish Hobbyist magazine. Overall we feel forums are an important and essential part of the aquatic community and we want to know if you'd like to participate in a link exchange on www.tfhmagazine.com. We would also like to extend your forum members a discounted subscription offer to the print and digital versions of our magazine and keep them in the loop of any upcoming discount offers." digital subscription for a MUCH cheaper price! The link will be a banner in the "Badman’s Recommended Links" area near the top of the forum. You will have to look here for any forum only specials. I will post here when I get more information. Good Magazine as I am a subscriber and also a registered member of the forum, whoops...Hands down though ...Badman's is the place to be...Shameless plug for Pat and this great site ! Oh, yay, we can comment. I am really excited about this, as they stopped offering me a discount after I ordered through my son's school, for full price. Celebrate Earth Day 2009 with Tropical Fish Hobbyist magazine! For 3 days only, grab a 1-year subscription to TFH digital for only $1! Yippee! Just signed up too! Thank you Pat! Last day to take advantage of this subscription special! Hey, folks, we're currently running a new promo for Halloween. Subscribe from now until October 31, 2009 & receive an aquatic product pack worth over $15 in awesome products, samples, and coupons! Visit www.tfhmagazine.com/treats for more info! Great deal on a magazine that keeps getting better! Just letting you guys know that our aquatic product pack deal is still going on. Hey, folks, for those who missed it in previous years, we are doing the $1 Earth Day promo again! With the passing of FAMA, we've decided to hold a new subscription offer for those wishing to migrate to our wonderful magazine if they have not done so already. For a limited time, new subscribers can get 12 full issues for only $15! New subscribers can get the offer on our website at http://www.tfhmagazine.com/specialoffer/. 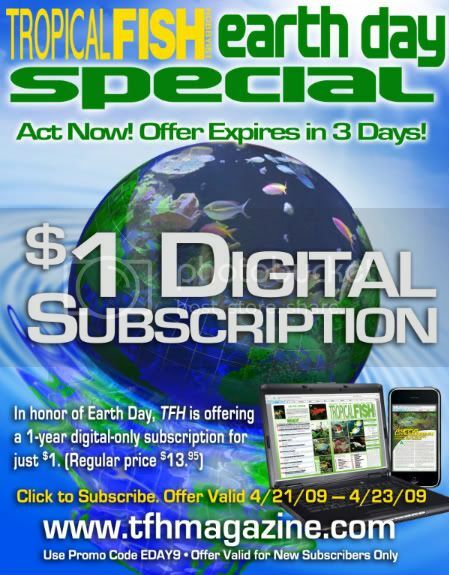 Subscribe to TFH Digital for $1 and be entered to win a FREE iPad from Tropical Fish Hobbyist Magazine! For a limited time only, get a one-year subscription to TFH Digital for only $1 and be entered into our FREE iPad giveaway! Your subscription to TFH Digital includes fully searchable archives of all issues from September 2007 to present. 2 More Ways to Win! 2) Current print subscribers: add TFH Digital for only $1 by subscribing from the page linked above, and enter promo code: ipad to be entered into the FREE iPad giveaway!